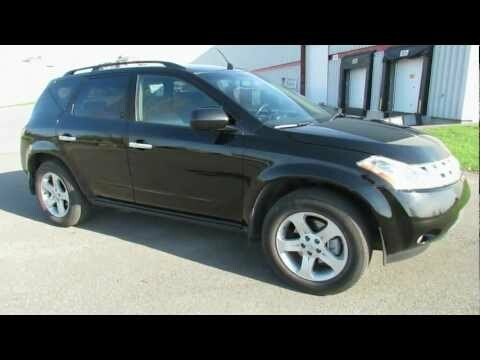 2003 Nissan Murano is extremely reliable. My vehicle is really reliable. It has lasted through long road trips through mountains and rough roads. Gas mileage is great. We can drive for about 6 hours straight on one tank of gas. It is a really comfortable car as well. Plenty of room and the seats lay back pretty far. The only thing I do not like is the seats are leather but that is just my personal preference. Features include a screen with GPS, how many miles until empty, tire pressure and displays specific alerts like oil change due or low tire pressure. It has heated seats which comes in handy in the winter with cold leather seats. This is a good car no complaints. I do not have any vehicle problems I really enjoy this car an it is my boyfriends so I cannot complain lol it has a lot of room it is comfortable it is smooth driving an it is not too big of a vehicle. We use it to do just about everything it has a lot of trunk space an the features are great no problems starting or warming up in the cold really a great value. It is a great family car plenty of space. My favorite feature is the seat fixes. Great on relatability and performance as long as you get you oil changes every once in a while. Does take a little longer for heat but great on gas. There seems to be more electrical problems then anything for instance my radio reception goes in and out often sometimes I cannot even use my radio for the day. I find twenty bucks usually gives me half a tank.